On June 6, 1997, Col Jeff Ethell was killed while flying a privately owned P-38 near Tillamook, Oregon. As the author of more than 60 books and over 1000 articles on military aviation, Jeff was well known and respected in the aviation community. He was also a consultant, writer and screen host for a number of aviation history videos and television series. Jeff is survived by his wife, Bettie and their three children. Jeff loved to fly, and that was where we met one day in the summer of 1985. It was a late Saturday afternoon, and a friend and I were practicing formation flying in a pair of SNJs north of Dallas, Texas. On the radio, I recognized the voices of other warbird pilots, and asked if we could join them. "Sure, come on over!" was the reply. The next thing I knew, we were being bounced by a Corsair, T-28 and replica Zero. 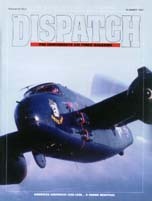 As the mock dogfight developed, I found myself paired with the Zero, basically a modified Texan, like my own SNJ. My wingman decided to call it a day, but I was having too much fun to quit yet. The Zero pilot was good, and with planes closely matched in performance, neither of us could get the other in his sights long enough for a "kill", despite constant climbing, rolling and diving in a tight circle. After several minutes of this, we broke off, as the Zero's leader in the T-28 had an airsick passenger, so we all agreed to land at the nearby Denton airport. In 1985, Denton was a quiet airport with little traffic and had been the site of major CAF air shows. Following the Zero on downwind, I had just lowered my landing gear when I saw the Zero accelerate and start a hard turn as its pilot tried to jump me and finish our friendly duel. Faced with this surprise attack, up came my gear and we went at it for another few turns before the Zero waggled its wings and landed. It was beginning to get dark and I had to return to an unlighted field, so I rocked my wings and headed home. It was later that same night when the phone rang and the caller asked if I had been flying the SNJ in the dogfight that afternoon. When I answered yes, he said "My name's Jeff Ethell, and I was flying the Zero. Boy, was that a lot of fun! We have to do that again". I had the chance to fly with Jeff several times over the next few years, including checking him out in the replica First World War Fokker D.VII and Pfalz D.III fighters of The Blue Max movie fame and my own Fokker Dr.I Triplane. In 1991, at the Wings Over Houston air show, we had another chance to dogfight, this time with Jeff in the CAF's real A6M2 Zero and myself in the FM-2 Wildcat. Naturally, Jeff wrote about both experiences, sharing with the world his experiences in these rare and historic aircraft. Jeff's father, Ervin C. Ethell, was a career USAF fighter pilot, flying P-51s and P-38s in World War II, and he taught Jeff to fly at an early age. However, Jeff's slightly imperfect vision kept him from a military flying career. After college, Jeff did postgraduate work in theology and counseling and was ordained a Baptist minister. Jeff and his wife, Bettie, counseled troubled youths, broken families and drug addicts, while raising and home schooling their own three children in Richmond, Virginia. Jeff's early writings were research papers, many for the Smithsonian's National Air & Space Museum. His first book told the history of Germany's rocket-powered interceptor, the Messerschmitt 163 Komet, and in 1973 he was granted clearance to fly current USAF, USN and USMC aircraft and write about his experiences. While flying F-4E Phantom IIs, Jeff acquired his call sign, "Fighter Writer", of which he was justly proud. Two recent honors highlight Jeff's dedication to military aviation history and those who flew and fought in defense of our country. In 1994 he was inducted as an honorary member of the Order of Daedalians, a very select organization of military pilots. In 1995, Jeff's desire to become a fighter pilot was rewarded with honorary membership in the American Fighter Aces Association. When he was about 10, Jeff found a color slide of his father, sitting on the wing of his P-51D. Like most, Jeff assumed that color photography was rare in World War II, but later, while researching photos for his books, he found that 35mm Kodak Kodachrome color slide film was available in the 1940s. Jeff collected thousands of color images taken by American servicemen during the war, and by the early 1990s, he began to share these rare views with others in a number of articles and books. In support of the CAF, Jeff provided hundreds of these color images for brochures, posters and to illustrate many articles in The Dispatch. He also gave tirelessly of his own writing and research to improve the quality of our magazine and other publications. He was a CAF fighter and formation check pilot and aircraft sponsor. In 1995, Jeff helped organize and moderated the American Airpower Heritage Museum's highly successful pilots' panel as part of the Pilots and Poster Girls symposium. Jeff Ethell's skill and dedication both as a pilot, aviation historian and author will be sorely missed. He is now a part of the history he so loved. Our sincere condolences to his family and his many friends.